Bulkhead. An outside sloping cellar entrance with nearly horizontal doors under which is the upright door leading directly into the cellar. A bulkie (not "bulkie roll" as outlanders might say, and pronounced bull-key) is a large white bread roll (not a hard roll) with a somewhat crispy crust and a somewhat chewy inside. They come plain or with poppy seeds. (See flossing.) Some people use them for sandwiches, but in Worcester they are most often bought on Sunday mornings on Water Street (the old Jewish commercial district) and are always eaten with cream cheese--real cream cheese also from Water Street, not the Philadelphia brand. 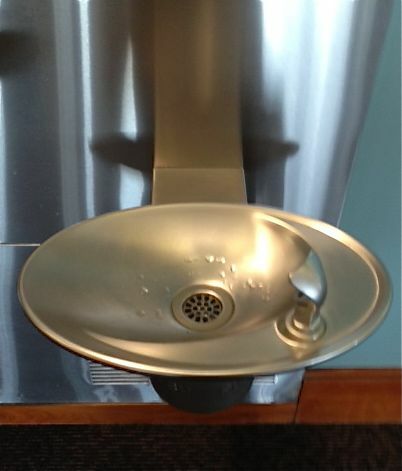 What some people call a water fountain. We pronounce it "bub-la" or "bub-a-la,"depending on our verbal sophistication. The water in the bubbler at Elm Park is wicked cold. DARE notes that the word has also been heard in Appleton and Madison, Wisconsin, and in Canton and Cincinnati, Ohio. The OED has a Save the Words site where you can adopt a word, use it, and save it from extinction. Sounds like a New Year's resolution project to me. I chose frutescent for this week's word: "becoming shrubby"; "having the appearance or habit of a shrub." It's time to trim the frutescent wisteria. A bahuvrihi is a compound word functioning as an adjective or a noun (although the American Heritage Dictionary insists it’s only an adjective). The last element in the compound is a noun. As in high-profile case. High-profile is the bahuvrihi, profile being a noun, and the compound modifying the noun case. Also, as a noun: bluebell, bonehead. The term comes from the Sanskrit bahuvrihih, having much rice. : bahu-, much + vrihih-, rice. Some bahuvrihis can have a plural form, but a singular meaning: lazybones, yellowlegs (the shorebird [another bahuvrihi]). Take a bahuvrihi modifier (low-life scumbag) and make it a substantive (He’s a lowlife) and something else odd happens. The plurals become regular. The plural of life is lives, but the plural of lowlife is lowlifes. Still life, still lifes. A lowlife is not a kind of life at all, so the usual irregular plural for life doesn’t apply, and the normal rule for making plurals does: add an s.
Sanskrit, like German, uses compounding frequently, and in Medieval Sanskrit, a compound might contain twenty or more elements and take up several lines of print. Besides bahuvrihi, there are these others. A dvandva (from the repeated noun dva, pair or couple) is a coordinating compound in which the elements are related to each other as if joined by and. Bittersweet means both bitter and sweet; roller-coaster means it rolls and it coasts. Some dvandva compounds, like those, are nouns. More often they are adjectives: father-daughter dance; North-South compromise. In tatpurusha (from the compound tatpurus, his man [as in servant]) compounds the first element qualifies the second, while the second retains its grammatical independence as a noun, adjective, or participle. Doorstop, yearbook, heartworm. These are dependent determinatives. Tatpurusha, by the way, is one of the eleven names of Shiva Bhagawan and one of the five mantras that constitute Shiva’s body (Om tatpurusha namah). Descriptive determinatives are called karmadharaya from karma, fate or action, and dharaya, holding. The first member of the compound describes the second. If the compound is a noun, then the first word is an adjective: blackbird (not any black bird), redbud (not a red bud, but a kind of tree). If the compound is an adjective, then the first word could be an adverb, well-known or a noun newly-appointed. Lake Superior State University's annual List of Words Banished from the Queen's English for Mis-use, Overuse, and General Uselessness. The OED's Words of the Year, 2009. This one you just might find in your Funk & Wagnalls. The word of the day. You won't find it in your Funk & Wagnalls. The word of the day. Despite what rock 'n' roll seems to think, alright is not all right! Is this a battle worth fighting? The American Heritage Dictionary says alright is Nonstandard. All right. And if you look at the usage note at all right you’ll see “Despite the appearance of alright in works of such well-known writers as Langston Hughes and James Joyce, the single word spelling has never been accepted as standard. The OED dos not say alright is a word; it says: “a frequent spelling of all right. And here’s the 1926 entry by Fowler: 1926 H. W. FOWLER Mod. Eng. Usage 16/1 There are no such forms as all-right, allright, or alright, though even the last, if seldom allowed by the compositors to appear in print, is often seen..in MS.
Word Court says: Alright is emphatically not standard English. Woe Is I says: No, alright is not all right–it’s all wrong! Rules for Writers says: All right is written as two words. Alright is nonstandard. Elements of Style says: All right. Idiomatic in familiar speech as a detached phrase . . . Properly written as two words. The Columbia Guide to Standard American English says: All right is the only spelling Standard English recognizes. Words Into Type says: alright. For all right–not accepted. St. Martin’s Handbook says: All right is always two words, not one. A Writer’s Reference says All right is written as two words. Alright is nonstandard. The Modern Writers Handbook says: Always write all right as two words, not as alright. Write 101.com says: Another term that suffers the same fate is all right; it's not alright. Things are never alwrong, why should they be alright? sentence: all the answers are right or the answers are satisfactory. much as any word in the language. The Ultralingua English Dictionary says: alright, Nonstandard. situation is likely to change. In the meantime, write it as two separate words. 1001 Commonly Misspelled Words says: all right. This expression is generally spelled as two words. Errors in English and Ways To Correct Them says: Alright is analogous to altogether and already . . . but is not yet acceptable in standard English. Webster’s II New College Dictionary says: Alright is nonstandard for all right. New Oxford American Dictionary says: Although found widely, alright remains nonstandard. A Dictionary of Modern American Usage says: Already for all ready has never been accepted as standard in American English. The Oxford Dictionary of American Usage and Style says: All right. So spelled. The one-word spelling has never been accepted as standard in American English. Practical English Usage says: The standard spelling is all right. And I understand the Scrabble dictionary says it’s a word. So you can use alright in your next Scrabble game. And I should add that Word's spell-check program has not detected any spelling errors. That's my favorite new word. "A person with your name who shows up when you google yourself." From Sunday's Times. e-mail bancruptcy:What you’re declaring when you choose to delete or ignore a very large number of e-mail messages after falling behind in reading and responding to them. This often includes sending a boilerplate message explaining that old messages will never receive a personal, specific response. Although the Stanford law professor Lawrence Lessing is often credited with coining this term, at best he can be said to have popularized it. Its first use was in 2002, two years before Mr. Lessig publicly declared his own e-mail bankruptcy.